The best and most accurate way to make measurements with your microscope is by using an eyepiece reticle that has been calibrated with a stage micrometer. Eyepiece reticles are available in a variety of options for measuring including grids, rulers, cross lines and even specialized reticles for measuring particles or thickness of materials. 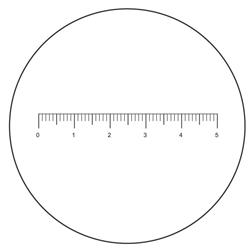 An eyepiece reticle is a circular piece of glass with a ruler or measuring symbol etched on the glass. The reticle is held in the microscope eyepiece with a retaining ring. When looking through the microscope the reticle image is imposed upon the specimen viewed through the microscope. 0.1 / 4 = 0.025mm is the distance between each line. 0.1 / 100 = 0.001mm is the distance between each line. Learn more about making accurate measurements here. And for information on calibrating your microscope using a stage micrometer click here.